Conversations with a Hypoxic Dog began on May 1 of this year. Last week a new format was introduced. Words and Language and other Nonsense will remain the focus; but a bit of History will be added. Additionally, I will now publish just once a week, on Wednesdays. This edition continues downriver with Lewis and Clark just 125 miles from the sea. My daughter sat on the foredeck and my wife and I filled the small cockpit of our West Wight Potter, a jaunty little sailboat just 15 feet in length. Leaving the glassy calm backwater behind Rooster Rock State Park, we eased down a short channel, gave the rocky submerged point some clearance and turned the bow upriver. The quiet water of the narrow channel from the park mooring posed no problem for the Potter. Once on the Columbia, the current became a different kettle of fish. A crown like that of a roadway marked the deepest water of the main channel as it flowed along at three or four knots. Our little 2 HP outboard could push the boat at two or three knots. I shaded the main flow and pointed her bow upriver. We were on our way, sailing to Cape Horn. Intrepid though the this first voyage on a new boat was, the notorious Cabos de Hornos at the tip of Tierra del Fuego was not our destination. That Cape Horn and this Cape Horn are similar in size, but both the weather and sea state are vastly different. The Columbia is not the Southern Ocean. 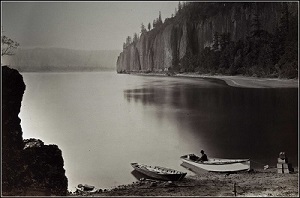 Historically, several shoreline outcrops on the river were daubed 'Cape Horn.' Two remain. 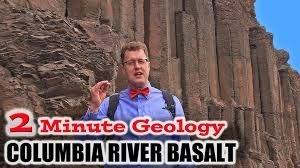 Our goal was the basalt cliff outcrop brooding over the Columbia at RM 132. On November 2, 1805, William Clark located the prominent feature at "... S. 47° W. 12 miles to a Stard. point of rocks of a high clift of black rocks ... " Strong local winds characterize the area, and the winds along with the general appearance apparently gave rise to the name. Our Cape Horn is an exposed section of Columbia River basalt. The rock was a product of several hundred fissure lava flows which covered most of Washington and Oregon and parts of Idaho. These flows were events of the Early Miocene, 17 to 5.5 million years old. The estimated volume of these eruptions was at least 700 million cubic miles, the largest such flows in the earth's history. Passing the beach at Rooster Rock Park, we were tempted to join the folks swimming in the warm shallows. The boat has a flat bottom with a lifting center board, and it would be a simple matter to beach her and have a swim. Noise from the bow seemed to be insisting on a change of course; but the Captain was having none of it. The mate suggested lunch. We pressed on. Phoca Rock, that curious phallic lump near the center of the river, became the Captain's goal. We would double Phoca mutiny or no. From Clark's journal, November 2, 1805: "... at 17 miles passed a rock near the middle of the river about 100 feet high and 80 feet Diamuter ..." Though they make no mention in their daily journals of seeing seals in the area , the rock was named for them. Phoca in Greek means 'seal.' In his notes from the winter camp at Fort Clatsop, Clark writes: "... 11 miles to the Pho ca rock in midl. Rivr. 100 foot high, Saw Seal's; ..." These were probably harbor seals, frequent visitors on the river from the mouth to, historically, the Dalles. The rock sits just 30 feet above the river today, erosion doing its work. As we motored on, the afternoon warmed and the wind came up from the northwest. Up went the mainsail, out rolled the jib. We sailed past Sand Island and came abeam of Cape Horn. Appropriately, strong gusts now saw the Captain taking in sail. It had also occurred to him that the return trip would find the wind on the nose, always a more difficult occupation. Wind against current began to creat chop. Confidence waned. The mate feared sea sickness. We gybed away from Phoca Rock and began to beat down river. Putting into the lee of Sand Island, some lunch, and a general lull in the afternoon breeze restored our confidence. We returned without incident to the shelter of the moorage behind Rooster Rock.